Our family has been breeding dogs in the Havanese family for over 20 years. There have been many times that we have kept two puppies at the same time and numerous times that we have sold two puppies at the same time through the years. In fact, Havanese are bred to be companion dogs, and as such, they need a companion, so we will not sell only one Havanese to a situation where everyone in the family leaves to go to work and school and the puppy will be left home alone during the day. I can say that I highly recommend getting two at the same time and have never personally had anything other than positive experiences from doing so, and have heard nothing but positive testimonies from people who have bought two of our puppies at the same time. That being said, there are articles on the internet which discourage getting two puppies at the same time and many of these concerns can be valid depending on the breed. One objection with getting two dogs is the concern that the puppies will not get the socialization they need because of the owners split attention. We have never had to split out attention when we have had two puppies because both puppies will be in our lap at the same time or one of us will have a puppy in our lap and another of us will have the other puppy in their lap, thus both puppies are getting plenty of snuggle time. Another objection is that dogs are pack animals and will develop a pack mentality. While it is true that all dogs are pack animals, how that is displayed differs between breeds. For example: German Shepherds are bred for protection and guard duty. They are more closely related to the wolf family and are more likely to fight one another for dominance or to gang up on whatever dog or human they find themselves in conflict with. If I were getting a German Shepherd I would be very careful to examine the lines and temperament of the Shepherds as well as the environment I would be bringing the dogs into before considering getting two. Havanese, because of their temperament, get along much better with each other than many other dog breeds. The issue of dominance is not really an issue and aggression just isn’t in their nature. Havanese love each other and enjoy being together. 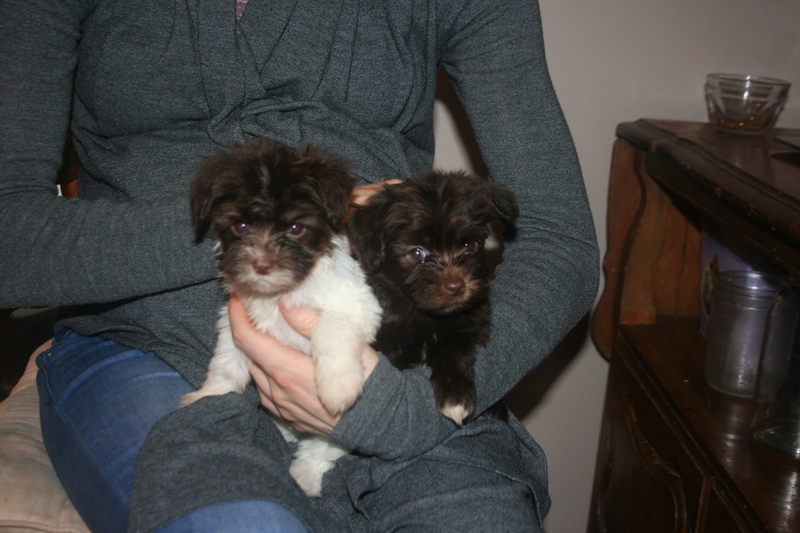 Havanese are bred to sit in your lap and that is exactly what they will want to do. We have a lot of Havanese at our house and ALL of our dogs will pile on top of us (and each other) when we are on the sofa watching TV. One of the biggest objections that I have read is “litter-mate syndrome” in which two litter-mates, who have been together since birth, become bonded to each other, develop separation anxiety or other unpleasant behaviors in relation to each other, and fail to bond with their human owner because of their strong bond with each other. This can be an issue for “one owner dogs” because of their tendency to pick only one being and bond to it. Because of the loving temperament of Havanese, I can not say that I have personally seen this with our dogs. Havanese will bond to each other, but that in no way takes away from the bond that they have with their people. Because of their capacity for love they have no problem bonding with multiple people and animals at the same time. As long as a Havanese has a person or another social dog to be with, they will have what they need to maintain healthy emotional stability. It is impossible for people to be with their dogs 100% of the time and having two Havanese guarantees round the clock companionship. Previous PostHow Do Emotions Effect Havanese Behavior? I totally agree. I think all dogs need a buddy of their own kind even if their human is home all the time. Our two are doing great! So thankful we got them both at the same time! Laura, I think we may have a brother (our white one) of your two. I am a proud owner of two very intelligent, loving Havanese. They are brothers as a matter of fact, from the same litter. Seperation anxiety is common with just a single pup, but a companion will ensure your furry pal has a playmate, even when youre not around. My furry pals make me smile anytime of the day, and I love them a whole lot. The more the merrier! !